Pro Martial Arts are experiencing an unparalleled rejuvenation in popularity, with MMA (Mixed Martial Arts) and UFC dominating the media. Training in these disciplines is fast becoming one of the most popular sports and athletic activities out there...and Isometrics are a KEY component in achieving strength and success in both an amaetur and pro martial arts career. Isometrics has become increasingly popular when it comes to getting more muscle and improve strength – it is also known as static or resistant strength training. Isometrics can also be used as a form of rehabilitation if you've sustained injury during MA training. (Read up on that - here). In this article we are going to talk about how isometrics can help a pro martial arts career become better and better. Overlooking these kind of exercises will not help you balance your fitness routine. By engaging your muscles in a different fashion, isometrics offers a different kind of workout that will enhance normal lifts. Isometrics makes heavy use of static positions and avoids moves that involve motion of any kind. Isometrics is just a form of strength training in which both the muscle length and the joint angle do not change during the process of contraction - you do this kind of exercise in a static position. Some martial arts and branches of yoga have been using isometric exercises for thousands of years. You will be using force upon a static object, for example a wall. Then tension is developed without any change in terms of length. Another form of isometric exercise is holding the muscle in a fixed position without any movement at the joint. Proper posture and strength in your core happens when you do some isometric exercises – just keep your abdominal muscles tightened. Here's a great example taken from my complete Isometrics training program - 7 Seconds to A Perfect Body. This just one of the many exercises I teach for developing strong shoulders and your whole body. 1. Stand tall and straight with your feet hip distance apart and your toes pointing forwards. 2. Keep you knees soft, that is slightly bent, and your abs tucked in tight. 3. Starting with the right arm place your fist in front of your right leg. 4. Grasp firmly with your left hand around the right wrist. 5. Slowly try to raise your right arm straight out in front of you (keep a slight bend in your elbow) while resisting with your left hand. 6. 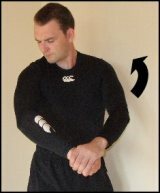 Build the tension in the shoulder muscles as you breathe in for 3-4 seconds. 7. Tense completely and push upwards as hard as you can while pressing down with the other hand breathing out in a “SSSS” sound for 7-12 seconds. 9. Repeat on the opposite arm. Again this exercise focuses on the front of the shoulder, the anterior deltoid. If you have performed this correctly when raising your arm straight out in front of you without any resistance it should feel as though it floats up. Get more great exercises - here. While performing isometric exercises, you have to exhale throught your mouth and inhale through your nose. Your body will feel a calming effect when you inhale through your nose, while a stress signal is felt when you inhale through your mouth. The calm effect of the body will give the maximum effect to this kind of exercises. If you want a full-body exercise, do some plank bridges right away. Lay your face down on the ground. Use your elbows, toes and forearms to support yourself. Hold the bridge for up to 30 seconds. Complete three sets. Extending your contraction time beyond thirty seconds will add difficulty. This is a favourite of mine and an excellent whole body strengthener for pro martial arts, particularly one's involving full and side mounts in ground based grappling. This is just a very basic introduction to how isometrics can help a pro martial arts career reach a new, high level. Isometrics will help you strength your body without having to move a lot. You will get a balanced fitness routine if you start off using isometrics while working out. You've been reading about Pro Martial Arts and Isometrics. Check out the other martial arts articles here.